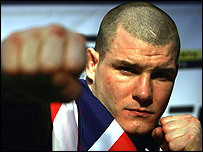 I’ll be the first to say that I don’t think Michael Bisping deserved a split decision victory over Matt Hamill at UFC 75. Hamill looked strong from start to finish, winning every round in my book, and he surprised a lot of people in doing so. But the bigger surprise came when the judges’ scores were announced and Bisping was somehow awarded two of the three rounds by two of the three judges (one of whom was Cecil Peoples, but what’s the other guy’s excuse?). Anyone who’s ever been in a post-fight press conference can tell you there’s only one reason a reporter (or cornerman) would ask that question. He was trying to get a rise out of Bisping, trying to prod him into action under the guise of asking a real question. Unfortunately, he got what he wanted. Then, reports Iole, Bisping made an obscene gesture. So this is where everyone piles on Bisping, criticizing him for his lack of grace when just a few hours earlier he was the media darling. I understand the sentiment, but Bisping deserves a break. What people are upset about to begin with is the bad decision. I agree it was the wrong call, but it’s not Bisping’s fault. He fought his heart out. Unless he got absolutely pummeled a fighter will almost always feel that he won. It’s like when a bad call works in favor of your favorite sports team. You immediately want to believe it was the right call, even if some part of you knows it wasn’t. Now just imagine how that feeling would be amplified if you were on the team, the only one on the team, and if your paycheck was riding on the call. It’s reasonable for Bisping to have blinders on here, and it’s also reasonable for him to react angrily to someone hiding among the press corps and trying to tear him down in front of international media. But the bigger problem that people are struggling with is the judging, especially since the UFC had to select their own judges due to the lack of MMA regulation in the U.K. From my experiences with the IFL, I know how quick people are to blame the organization for a bad call, even though it’s completely absurd. Whatever I may think of Dana White, I do not believe he would instruct the judges to give a fight to a particular fighter. He may be crude and brash, but he respects fair competition and, as an astute businessman, would realize he has far more to lose than gain by putting the UFC’s credibility on the line like that. The IFL stills gets emails from people who are upset about the decision in the Ben Rothwell-Roy Nelson fight. They claim we’re trying to prop Rothwell up, that the fight was a farce, that Jimmy Hoffa’s body was hidden under the ring. You name it. Nelson even appealed the decision, and for some reason he genuinely thought it might get overturned, despite the fact that this almost never happens. The Rothwell-Nelson fight was closer than Bisping-Hamill. And I’ve talked to both Rothwell and Nelson several times since that fight and both are absolutely convinced that they won, so much so that they can’t even comprehend how anyone could disagree with them. They’re fighters, and that mindset comes with the territory. But one thing all fighters know is that as soon as you allow a fight to go to a decision, you’ve already placed yourself at risk. The only way to be certain of the outcome is to finish the fight. Judges have done some crazy things, and they will continue to do more crazy things in the future. It doesn’t mean there’s a conspiracy at work. It just means that judges are people, and sometimes people make mistakes (especially those who have the word ‘people’ embedded in their last name, for instance). It’s understandable to be upset about a bad decision, but there’s no reason to jump all over Bisping or the UFC for it, just like there’s no reason to keep sending crazy emails to the IFL about fights that happened six months ago. The best way to deal with it is to do what the IFL’s John Gunderson did, when he was absolutely robbed of a win over Bart Palaszewski on the same card as Rothwell-Nelson. In the post-fight press conference, as well as in the post-press conference bar conference that has become my favorite ritual while on the road with the IFL, he allowed that, yes, he believed he should have won, but it was his own fault for not making that more evident. That’s class. As for Palaszewski, he admitted that it wasn’t his best performance and that he was surprised to have gotten the decision. He did not make any obscene gestures or swear at anyone, but then again nobody in the press conference was enough of a jerk to try and get him to. Class is something we have a right to expect from everyone, after all, not just the fighters.